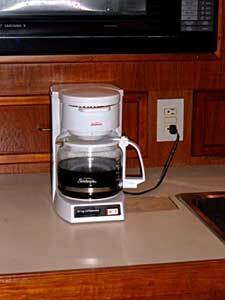 There needs to be a safe and handy location for the coffee maker. Currently, there is not a spot that it can be put out of the way. It is too tall to slide back under the cabinet and just seems like it is thrown there in the middle. We found the answer to our coffee pot on the counter problems. Brew Express! This special unit mounts in the wall so it does not cluter your counter. In addition, you do not have to pour water into it. The unit is connected to your water supply and is therefore automatically filled. 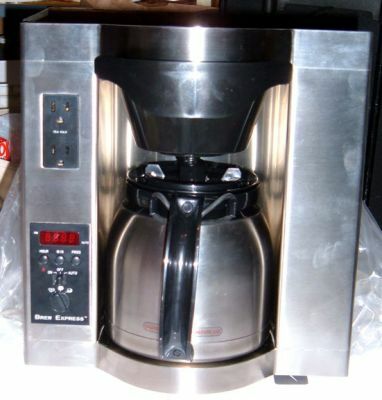 It does not boil the water but heats it to the optimum temperature for brewing, not scorching the coffee. There is such a thing as a pause stop - you can pour the first cup and a carafe to keep it warm. It even has extra outlets. The carafe has a clip so it will not fall out during rough seas. 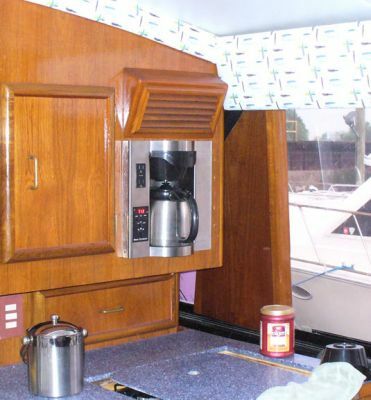 It even comes with an additional filter cup so you can run water through for hot tea, soup, etc. The timer can be set the night before and programed for your morning brew. This is such a smart idea! It frees up counterspace while also securing the coffemaker. It has its own water-feed so you do not have to pour water into it. It is programable. It does not burn the coffee but brews it while dispensing into the carafe. It also comes with an extra basket so you can brew tea, etc. It also has a pause and serve. In-fact, it's pause and serve utilizes an electric eye and stops the water-flow into the brew basket when the carafe is removed.